Compact, smaller and lighter than other wrist monitors. The LifeSource Advanced Digital Wrist Blood Pressure Monitor allows you to easily and accurately measure your blood pressure away from home. Its small size and battery operation are convenient for travel, while a pressure reading indicator that interprets the numbers and an irregular heartbeat indicator quickly alert you to the status of your blood pressure. Additionally, the monitor features a 90-reading memory to help you track your pressure measurements over time. 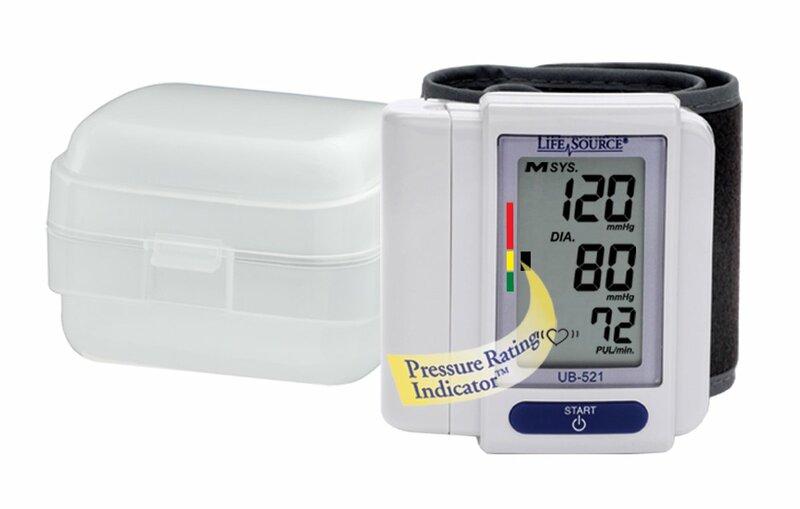 This monitor features a Pressure Rating Indicator to help you know whether your blood pressure is high, low, or within normal range. View larger. With a compact, lightweight design, this wrist monitor makes it easy to check your blood pressure when you are away from home. The portable wrist cuff and monitor are integrated into one piece for portability, and the unit comes with a carrying case for convenience. Since it operates on two AAA batteries (included), the monitor does not require you to be near an electrical outlet to take your blood pressure. With a single start button, this wrist monitor removes complicated processes for measuring your blood pressure. When you press the button, this cuff quickly inflates. Unlike other blood pressure monitors that take your readings while they are deflating, the Digital Wrist Cuff measures your pressure as it inflates for faster, more comfortable reading. 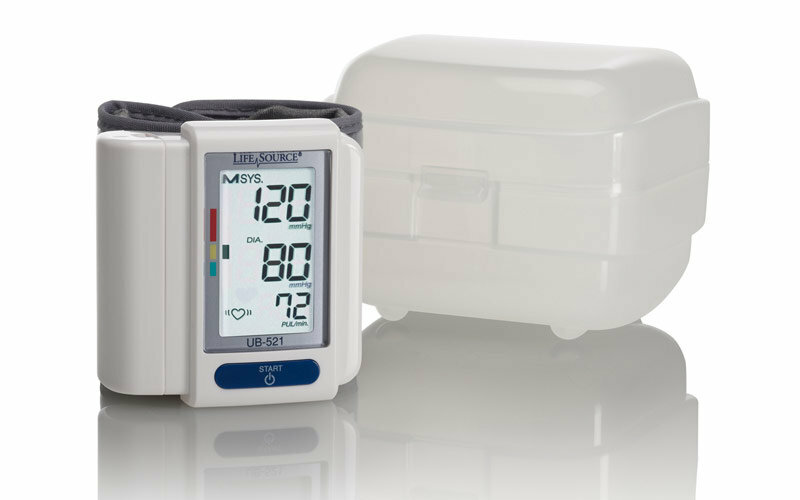 The monitor features a Pressure Rating Indicator that eliminates guesswork by indicating whether your blood pressure is high, low, or normal. While a trained professional should always interpret your blood pressure measurements, the monitor provides an easy way for you to see your pulse and blood pressure levels and understand how the numbers compare. The Digital Wrist Monitor stores the last 90 measurements, allowing you to track your blood pressure and pulse over several months. The average reading feature calculates the average of total readings stored in the memory, so you can easily see your pressure over time. This LifeSource wrist monitor also displays a symbol to alert you when your heartbeat is irregular. Plus, even when your heartbeat is irregular, the monitor will provide an accurate blood pressure and pulse rate reading. LifeSource Advanced Digital Wrist Blood Pressure Monitor, two AAA batteries, carrying case, quick start card, and bilingual instruction manual (Spanish and English). 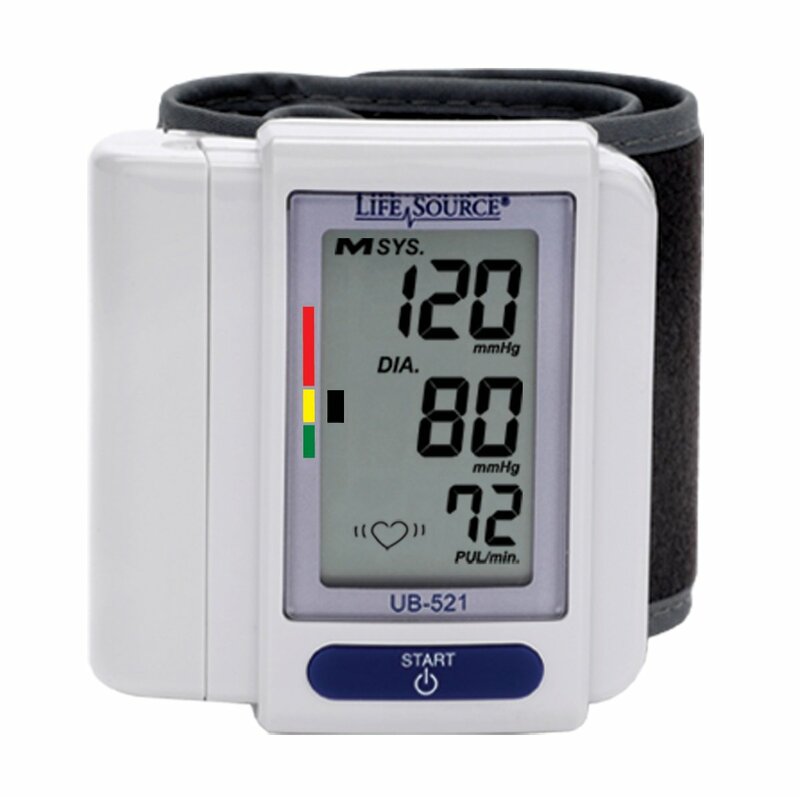 A&D Medical has applied state-of-the-art measurement technology to the LifeSource UB-521 Digital Wrist Blood Pressure Monitor. This wrist monitor is smaller, lighter and more compact than other wrist monitors and is ideal for travel. 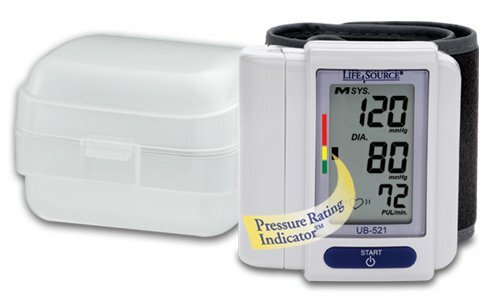 Unlike other monitors that measure blood pressure during deflation of the cuff, the UB-521 wrist monitor measures blood pressure during cuff inflation for a faster, more comfortable reading. The automatic memory keeps your last 90 blood pressure measurements for effective tracking.